Note: Some of these questions are now answered in much more depth in my book, Weaving the Web. Adults, see also: the main FAQ. If you need the answers for a school project or just because you're interested, then feel free to quote them from here. In your report, please say where you got them from. I'm interested in math more than what's at school - what is fun? At CERN, people study High Energy Physics. That is the physics of really really small particles - particles much smaller than atoms. It turns out that if you want to investigate really really small things, you need huge machines called accelerators to smash particles together really hard. Then you have huge gadgets (about the size of a house) which detects what happens, and what bits fly off, so you can figure out whether you managed to make any new types of particle. CERN is a big place - a few thousand people work there. Many of them are scientists whose jobs are at universities in different places in the world, and they come to CERN because they need to use the huge accelerators at CERN. I actually wrote some programs to take information from one system and convert it so it could be inserted into another system. More than once. And when you are a programmer, and you solve one problem and then you solve one that's very similar, you often think, "Isn't there a better way? Can't we just fix this problem for good?" That became "Can't we convert every information system so that it looks like part of some imaginary information system which everyone can read?" And that became the WWW. When you are reading a web page, the computer isn't showing you everything about the link. Behind the underlined or colored bit of text which you click on is an invisible thing like http://www.w3.org/. Its called a URL. This is the name of the web page to which the link goes. 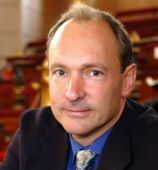 (The web page you are reading has this one: http://www.w3.org/People/Berners-Lee/kids). Behind each link, hidden from you, is the URL of the other web page, the one you'd get to if you followed the link. When you click on a link, your computer takes this URL. It wants to get a copy of the web page. There are a few different ways of doing this. The one I'm going to tell you about is just used for URLs which starthttp: . If the URL starts with http:, then the computer takes the next bit of the URL, between the // and the /. It might be www.w3.org for example. This is the name of the web server. However, It can't communicate with the web server until it knows its computer number, because the Internet actually works with numbers. So there will two stages to this - first, finding out the number of the web server, and then asking the web for a copy of the web page. The Internet is a net -- really shaped like real net like a fishing net -- of computers all connected together by various cables. Each computer, when it gets a packet, looks at it and sees what computer number it is being sent to. It then just passes it on to the next computer in the net, in the general direction toward its destination. Pretty simple? yes, well, it is simple. The packet gets passed on until it gets to its destination. Typically, a packet might be passed on by more than 10 computers before it arrives. Ok. Your computer now knows the number of the web server, www.w3.org. So it goes back to the URL -- remember the thing which started with http:? Lets say the URL behind the link was http://www.w3.org/People/Berners-Lee/FAQ . It has used the www.w3.org bit to find the number of the web server which has a copy of the page. Now it send off a request to that server asking it for the web page. It sends the whole URL, and the server sends back a copy. The only problem is that the web page won't fit in a packet. Packets can only be around 512 bytes - about long enough for a text message of 500 characters. Even the request that your computer sends off can be longer than will fit in a packet. So what happens is the computer just breaks the message into parts, and sends each part in a packet. I told you this isn't rocket science. It just like a television series coming in installments. It also puts in each packet a packet number so that the other computer can make sure its got all the parts and got them in right order. So your computer gets back a bunch of packets with bits of the web page in them. It puts them in order and displays them on your screen. There are special codes (called HTML tags) which tell it when to do things like headings and bold and italics and ... oh, of course... links. Yes, every time it finds the HTML tag for a link, it displays the text specially (like blue and underlined) and makes a note of the URL of the linked page. Because at any time, you could click on the link, and it'll be doing this stuff all over again. So the difficult bit was persuading people to join in. And getting them to agree to all use the same sort of HTTP, and URLs, and HTML. I'm still doing that sort of thing. The World Wide Web Consortium (W3C) is like a club of people and companies who feel the Web is important, and keeping it working is important, and making it even better and even more powerful is important. I am the director of W3C (I started it) but thousands of people are now working on all kinds of wonderful things. Unbounded opportunity... limited only by your imagination. I made some electronic gadgets to control the trains. The I ended up getting more interested in electronics than trains. Later on, when I was in college I made computer out of an old television set. I bought the television from a repair shop down the road for �5 (about $7). No, I don't want to - sorry. I like to keep work and personal life separate. What is on the web on this page and my home page is all there is. Please do not email me asking for more information for school projects, etc. Look -- if you had written a program like WorldWideWeb -- which you well might --- would you want everyone to know what you had for breakfast? No, you see? Ok. Thank you for your understanding. But I am doing a project where we have to get "primary" sources, which means I have to interview the subject. And I'm doing it on you. So I have to interview you. I'm sorry, I don't have time to talk to everyone individually. Please use these web pages. I'm interested in Math -- what exciting stuff is there we don't do at school? Some kids find solving math problems is fun, and like the power of having new techniques, and imaging new math concepts. If you are one of those, and you are wondering what bits of math might be fun to follow up on your own or with friends or friendly adults, here is an attempt to explain some paths which connect together. Some of it is easy, some hard, but honestly which is which for you depends on what your mind happens to grasp, and how well it is explained! These are some of the bits I found interesting. This is NOT an explanation - you will need books and people for that . It is just a sort of list of places you might want to go. When you've done a bit of algebra, then simultaneous equations are good thing to play with. You don't have to do complicated ones, just look at "linear" equations where you have say 3 equations and 3 variables, say x, y and z. Because you've done vectors, you can visualize each equation as a plane in 3d, and the equations together define a point with a given x, y and z. Once you've got the hang of that, look at transformations where a set of linear equations define a new (x', y', z') in terms of any original point (x, y, z). Second neat thing: because you've used stacks of 3 numbers as vectors to represent points, you'll be happy representing the numbers in the equations in a 3x3 block called a matrix. This way you can write the transformation as a thing called matrix multiplication. You learn how to multiply matrices. where the bold letters stand for vectors and matrices. Suddenly all kinds of things fall into place. To make a combined transformation, you just multiply two matrices together. You naturally start wondering about how to undo a transformation, which is finding the inverse transformation, which is finding the inverse of a matrix. And then you realize that this is just the same problem as solving the linear equations you had earlier. So any time you can see how to solve the equations, you can find the inverse matrix. Also, there is a way of working out the inverse of a 3x3 matrix, so you can always solve 3x3 equations (when a solution exists). It is this way everything fits together which makes math fun and powerful. Another branch you might be interested in is calculus. This is about things changing and moving, to its very connected to physics, skiing, driving cars, flying planes, and so on. So it can also be fun to visualize. When you study calculus, you start off by thinking about how (say) the speed of a ball changes in a particular millisecond, and how its position changes. There is a lot of calculus where you know, say, how something's speed changes with time, and you want to figure out where it gets to. How fast a function changes is another function. Finding it is called differentiating the first function. The inverse is called integrating. Some people find learning and puzzling out how to differentiate and integrate all kinds of functions interesting. This makes all the equations writable in much less space (without even any x's and y's and z's). One of the significant equations which you get from look the physics of all this is the wave equation, which tell you about sound waves in a swimming pool and even Maxwell's Equations which show that light waves follow from the properties of electricity and magnetism. I guess I've used physics as the hook for most of this math, and that is one reason why it is interesting personally for me. If that doesn't interest you so much, then maybe the math of prime numbers will. Check out modulo arithmentic, Euler's theorem, and work your way to the RSA algorithm for public key cryptography. There are lots of other areas of math of course. And lots of books on each. And web sites, I'm sure. But there are some of my suggestions if you are looking for a map of things to look for. The main thing is, to have fun. Let's use the web to create neat new exciting things. Let's use the Web to help people understand each other.